Dogs are excellent interpreters of canine body language and signals. But how good are we at reading dogs? Sure, you know that ears back and tail down means a dog is afraid, and that a show of teeth is your cue to move away slooowly. 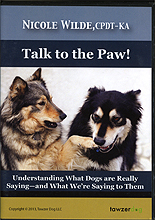 But thereâ€™s so much more to canine body language and communication. What does it mean when a dogâ€™s teeth chatter, or when the lower jaw trembles? How dangerous are air snaps and muzzle punches? Is there a significance to which side your dogâ€™s tail wag favors? What are the active and passive defense reflexes? Can you recognize the subtle signals that tell you when a dog is afraid? Do dogs â€œlaughâ€� and if so, how can we make use of it? Youâ€™ll hear about all of these things, and will also gain a much better understanding of how human body language and vocalizations can have a huge impact. Youâ€™ll see how even your smallest gesture can affect the way dogs react, both in training and in everyday interactions. Best of all, youâ€™ll learn how to use that knowledge to gain cooperation and trust. The lecture is packed with eye-opening information including the latest research studies, as well as an extensive collection of fascinating photos and video footage. By viewing real-time video and then slow-motion playback, youâ€™ll improve your observational skills and discover subtle, lightning-quick signals that otherwise might have been missedâ€”even if youâ€™re a professional.